LetÍs talk turkey. And jerky. Because the truth is, we were doing ñartisanal,î ñsmall-batch,î and ñhand-craftedî before it was cool. And we donÍt need suspenders or a weird mustache to prove it. 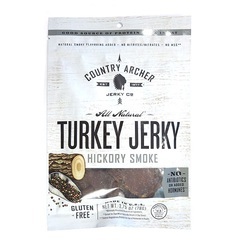 Our hickory smoked turkey jerky is prepared the way it was always intended „ with slices of real turkey breast, real smoke flavor, and no nonsense. Plus, itÍs conveniently packaged in an artisanal pouch „ perfect for your messenger bag, fixed-gear bicycle, vest pocket, or wherever you store your meat snacks. Try a batch today. And remember: real men donÍt have buns.